No matter how fluffy your little pal may be, they evolved from a meat-eating wolf who only worried about whether or not they’d make it through the day. There’s a reason your dog enjoys those raw bones you pick up from the grocery store—the age-old formula of protein and fat. A dog’s jaw has strong, sharp teeth that allow them to scrape off as much meat as they can, no matter where they find it. To feed your dog properly, just remember their inner wolf. 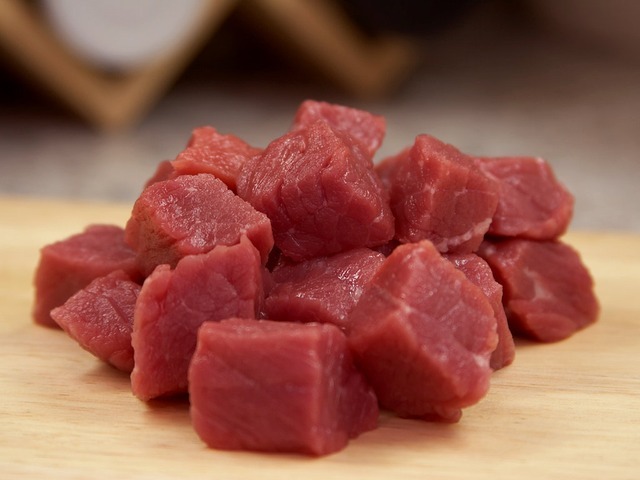 Protein and fat can be nicely delivered in raw meat containing no preservatives. This means your dog shouldn’t be eating sausage, processed meats, or even heavily cooked meats. Raw meat not only contains energy sources like protein and fat but also vitamins and trace minerals that will help keep them healthy. Some people choose to give their dogs vegetable proteins which, while helpful, can be more difficult to digest. The Merck Veterinary Manual recommends a little over 1g of protein per pound of your dog’s weight. While protein and fat have important energy sources that generate new muscle growth and other cells in your dog’s body, there is more. While dogs’ digestive systems are far more versatile than ours, make sure to ask your veterinarian if your dog needs anything special—some dogs are prone to stomach issues. Is your dog fussy about eating? Consider talking with a professional trainer for help.